Steinberg is now shipping the latest version of its HALion virtual instrument. Oliver Grimm has released Sound 8, a new 8 track sound looper App for the iPhone and iPod touch. Steinberg today unveiled HALion 4, the latest incarnation of the VST sampler. 02/20/11 in Spectrasonics Omnisphere 1.5 w/ "The Orb"
Spectrasonics have released the new Omnisphere v1.5 update. New Sonic Arts has announced that a Mac OS X Audio Unit version of Granite, its "Granular Texture Generator" instrument plug-in, is now available. 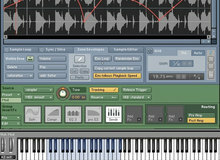 MOTU has introduced the latest version of its virtual sampler software. [NAMM] Omnisphere 1.5 incl. "The Orb"
01/14/11 in Spectrasonics Omnisphere 1.5 w/ "The Orb"
Spectrasonics has announced and demonstrated a new version of their Power Synth Omnisphere at NAMM 2011. Upgrade includes Symphonic Choirs "WordBuilder Inside Play". Until the 1st January, New Sonic Arts are offering Granite for $49 instead of $80.